평야마을에 자리잡아 북동향하고 있는 기와집으로, 지은 연대를 알 수 있는 기록은 없으나 건축양식으로 볼 때 19세기 중반에 지은 것으로 보인다. '一'자형의 행랑채 안쪽으로 'ㅁ'자형의 안채가 있고 안채의 동쪽 옆에 사랑채가 '一'자형으로 연결되어 있다. 행랑채는 7칸 규모로 왼쪽 끝에 바깥대문이 설치되어 있고, 부엌과 광·방으로 구성되어 있다. 동향한 안채는 중문을 들어서서 안마당의 오른쪽에 있다. 이는 대부분의 중·상류주택이 몸채를 안마당 건너편에 두는 것과는 달리, 일조를 고려한 것으로 보인다. 사랑채는 안채보다 간결한 구조를 한 3칸집으로, 사랑채 남쪽에 단 차양지붕이 돋보인다. 차양지붕은 사랑채 1칸 앞에 팔모기둥을 세우고 그 위에 옆면에서 볼 때 사람 인'(人)'자 모양의 맞배지붕을 얹은 것이다. 앞면에는 겹처마를, 뒷면에는 홑처마를 달아 앞쪽을 더 길게 처리하였다. 안채의 뒷뜰에는 3칸의 초가집이 있는데 일종의 공부방이었을 것으로 보인다. 비교적 지을 당시의 모습을 잘 간직하고 있는 집으로, 공간의 짜임새가 빈틈없이 구성되었으며 호도나무나 감나무 등이 어우러져 소담한 분위기를 자아내고 있다. Situated in a plain village, this tile-roof house does not have a construction record; based on its architectural style, however, it seems to have been built in the mid-19th century. 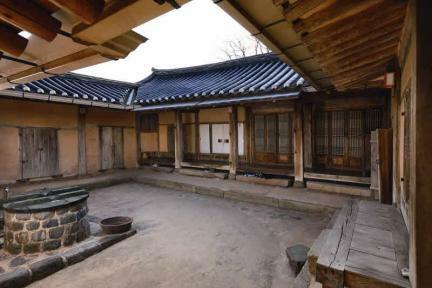 Inside the “ㅡ”-shaped haengnangchae (servants' quarters) is the “□”-shaped anchae (women’s quarters). 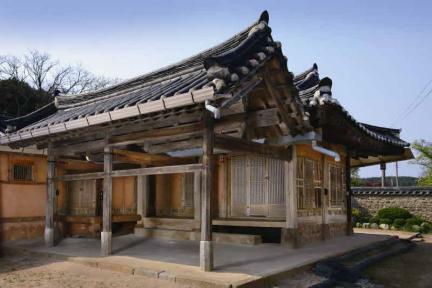 The “ㅡ”-shaped sarangchae (men’s quarters) is connected to the east side of the anchae. 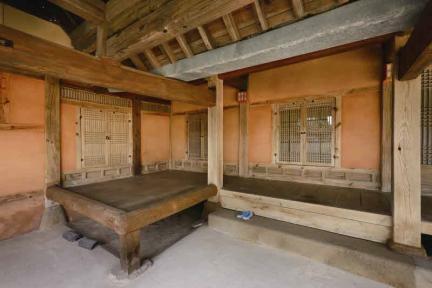 The 7-kan (a unit of measurement referring to the distance between two columns) haengnangchae has an outer gate on the left end and consists of a kitchen and a shed as well as rooms. The anchae facing east is situated on the right side of the courtyard after the middle gate. 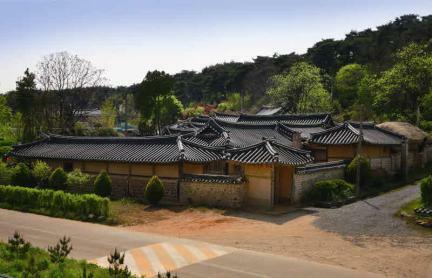 Unlike most high-class houses, which place the anchae across from the courtyard, this house placed the anchae such that it receives good daylight. The structure of the saranchae is simpler than that of the anchae. The skirt-roof south of the sarangchae is quite impressive. 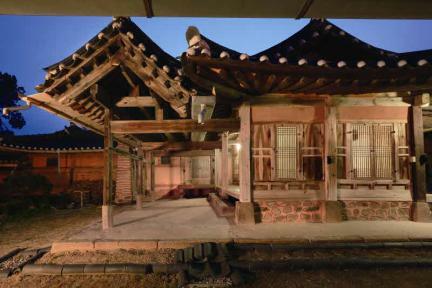 This roof was erected with octagonal pillars in front of the sarangchae and built in the gable style with “人”-shaped sides. The front side of the roof has double eaves, whereas the back side has single eaves; thus, the front side is longer than the back side. 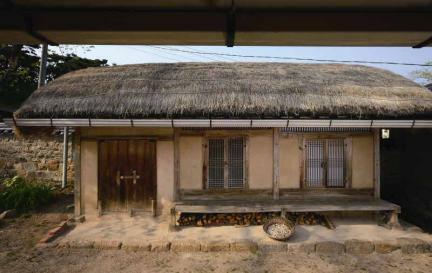 In the backyard of the anchae is a 3-kan thatched house that seems to have been used as a study room. This house is relatively well-preserved, with a well-organized architectural composition and a cozy atmosphere in harmony with the walnut trees and persimmon trees planted around the house. ※ Viewing of the cultural property above is usually available anytime but may be limited depending on the owner’s personal circumstances.